I picked up a Honda EU2200i generator a few months ago because my old generator did not provide clean power. One of the things I liked about it was the 12 VDC output. I hooked the generator up and decided to see how it performs. I’ve had a generator for several years now. It’s come in handy during ice storms, tornadoes and other random events that disrupted my power supply. There are two annoyances with my existing generator, namely it is loud and does not provide clean power. What do I mean when I say clean power? Simple. The many UPSes I have on my computers and network equipment refuse to acknowledge the power coming out of the generator as good power and will not charge off of it. That means that I have to plug my hardware directly into it to get it to run. I’ve heard a lot of good about the Honda inverters so I decided to purchase a EU2000i only to find out that I waited to long and I had to get a EU2200i. Oh darn. Being an engineer who just dropped close to a grand on a generator, I wanted to see what it bought me. 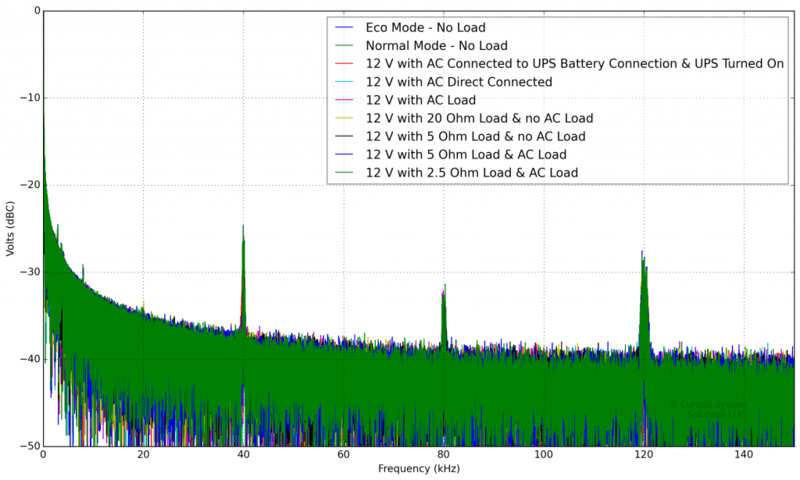 I was especially interested in the 12 VDC output as I thought I might want to run some of my 12 VDC hardware, like radios, off it (foreshadowing). AC Load Rigid Shop Vacuum Do you know how expensive a real AC test load is? Test UPS CyberPower CP1500PFCLCD The newest UPS I had to test. There’s not much news here. They look good. There’s a little variance in the output voltage, but not much. And no dropouts. We see all noise lines at -25 dBC from the main signal. We see lines at 40, 80 and 120 kHz. We measured out to 500 kHz and saw no other noise lines. There is also some close in noise at 2.92, 3.63 and 7.96 kHz. Not bad. Let’s just stop here and set expectations. This is an unregulated 12 VDC output. The manual specifically says it is only for charging batteries. This was disappointing as I expected a regulated 12 VDC output I could run some amateur radio equipment on in an emergency. I thought I would show you noise plots in the spectral domain telling you it was a nice clean signal. Nope. This is an unregulated 12 VDC output. I don’t need to show you frequency domain plots. The time domain tells all you need to know. 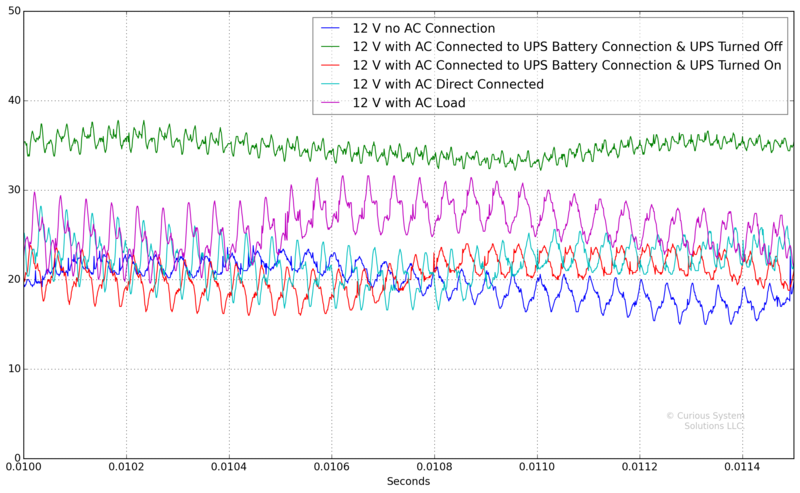 We took some measurements under different AC and DC loads because the higher the DC load, the higher the voltage output on the DC line. Let’s look at the unloaded waveform first. 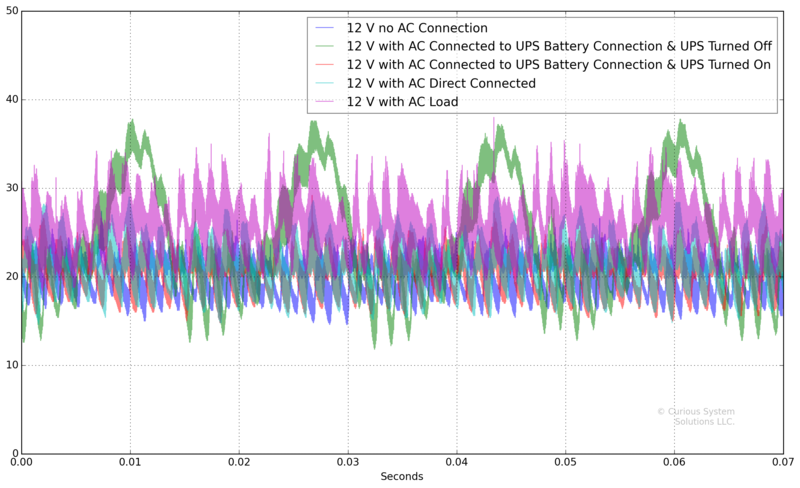 We’re seeing our 12 VDC unregulated output spike up to 38 VDC without a load present. This is one reason why this is not for running equipment. Let’s look at that a little closer now. At this point you may be thinking, “OK, it’s unregulated. I can regulate it and we’re good to go.” Not so fast. 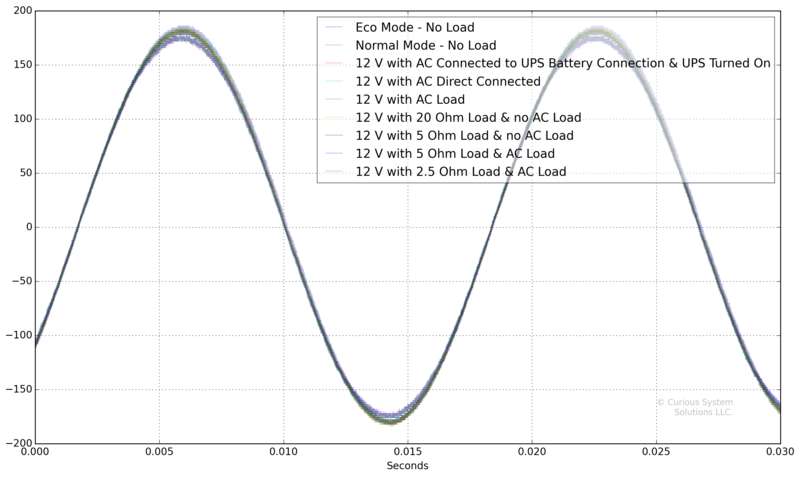 We hooked our DC load up to the DC output and did some measurements. 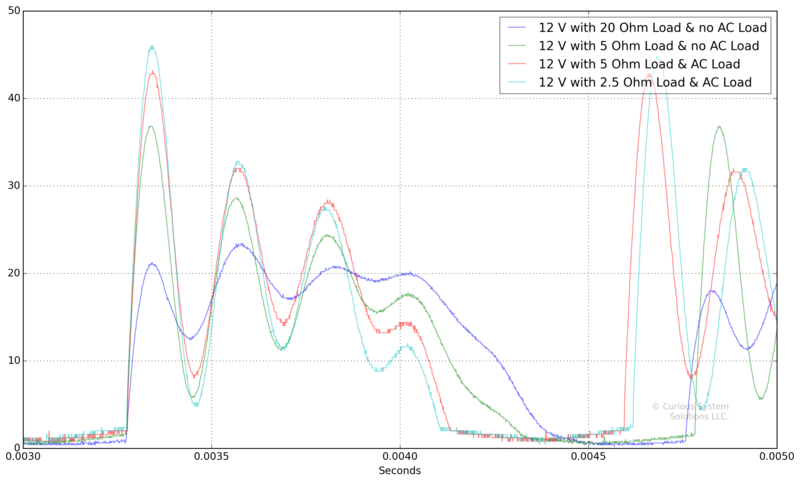 As you see, we drop to 0 V in between every pulse and we see voltage spikes up to 46 Volts! This is why this is for battery charging only. This is a beautiful generator that puts out clean 120 V, 60 Hz power. Do not use the 12 V output for anything other than charging batteries. Chad is an electrical engineer that enjoys electronics design.